There are 4 ways to order the stories that you see in EzyInsights. This option is designed to show you the content that is engaging users at this very moment. 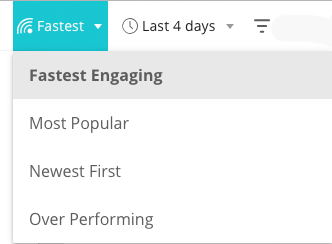 "Fastest Engaging" is by far the most used Sort Ordering option. Taking advantage of EzyInsights real-time technology, you'll see stories in order of Current Speed measured in Engagement Per Minute. This option orders the stories by Total Engagement. It will show stories that have generated the most engagement. This option surfaces stories that are doing better than average, regardless of the size of their page. This option is ideal for seeing stories that are engaging local audiences. For more details, see this article. If you need to see stories in chronological order, this option is for you.